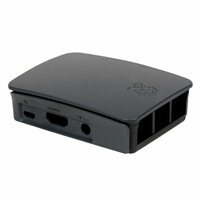 Just like the raspberry and white version except in sleek black, this Official Raspberry Pi Foundation enclosure is all about style and functionality. Removable side panels allow unrestricted access to all the Pi's ports and a removable top cover and frame allow you to use the case with HATs in place. 3.78" x 2.76" x 0.98"